Say hello to your new picnic staple. Packed with savoury sliced meats and cheese, crisp cucumbers, tomatoes and dill pickles, this recipe truly is The Ultimate Sandwich Solution. SPREAD both halves of loaf with Miracle Whip. 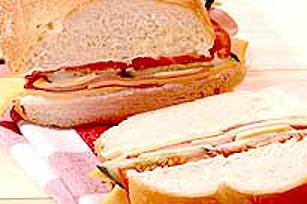 COVER bottom half with alternating layers of meat and cheese slices. TOP with cucumber slices and tomatoes; top with other half of bread. Serve with dill pickles. Keep it cool by packing the sandwich with a plastic container of CRYSTAL LIGHT Low Calorie Drink that you've put in the freezer overnight. It will keep the sandwich cool and thaw by the time you eat. Pack marinated salads in ziplock bag to keep fresh.